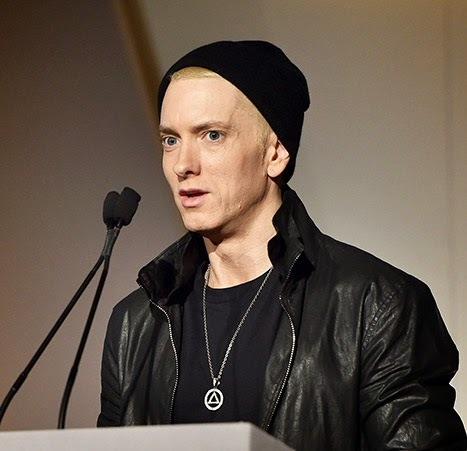 He is the real slim shady but he can't get any slimmer.Eminem was at the 'Wall Street Journal' Innovator Of The Year Awards in New York on the 5th of November. Eminem's slim figure was quite shocking as he was almost unrecognizable by many. Eminem was present at the ceremony in honor of Dr Dre who discovered him.In his own words:"Dre and Jimmy are like a force of nature,". "As an example of how powerful they are, they had me fly here all the way from Detroit to speak publicly, and I really hate public speaking." The rapper gained weight a couple of years back but decided to shed a lot of pounds. However, he was taking it a bit far, even by own admission at one point, he was running 17 miles per day. Eminem has also admitted his past addiction to prescription pills like Valium and Ambien which had him going into rehab in 2005. We sincerely hope the Grammy award winning rapper is in good health.Maybe Eminem is taking his 'Real slim shady' moniker seriously.